Two of the best private wildlife refuges with on site eco-lodges in Costa Rica are adjacent to Dominical (Hacienda Barú) and Uvita (La Cusinga). Both specialize in birdwatching but have wonderful trails where anyone can enjoy walking (or in the case of the mirador at Barú climbing steeply) through the forest they protect. Sloths are very easy to spot in the treetops. Pizotes and Howler and Capuchin monkeys will come right to you and some of the trails are wide and clear enough to be comfortable walking at night when you might see cats or other rare inhabitants. Each also has a path down to a semi-private beach. There are no privately owned beaches in Costa Rica – they are all public – but because these are surrounded by the wildlife refuges they’re mainly visited by guests of the ecolodges. The national park at Uvita is very popular with Ticos camping during school holidays. It protects a long stretch of beach and the “whale tail” a sandbar that looks amazingly like the tail of one of the humpbacks the park is named for when viewed from the air. It’s possible to see humpback whales in the warm water offshore where they come to calve. Because there are both northern hemisphere and southern hemisphere pods that share these waters in opposite seasons there are whales in the area nearly year round. 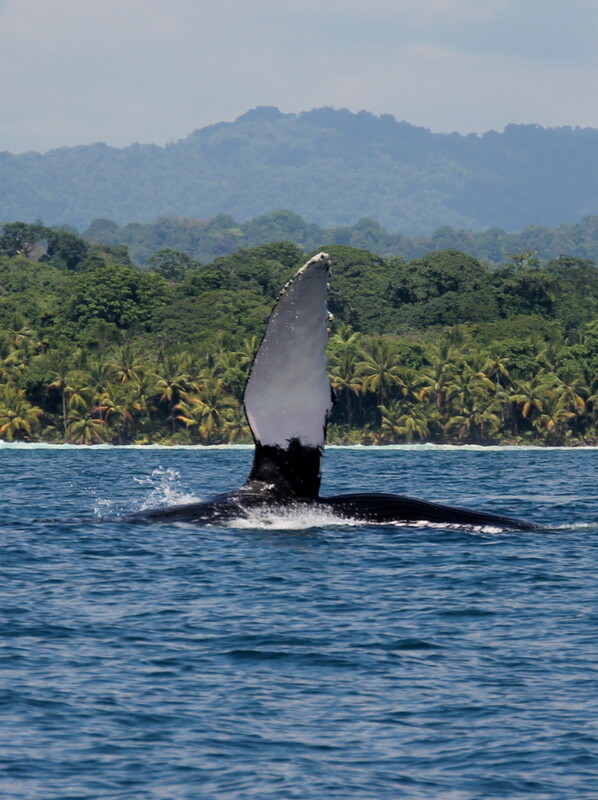 Marino Ballena park also serves as a launch point for boats to Cano Island Biological Reserve. Visitors that don’t have time to make the trip all the way to the Osa Peninsula can enjoy the snorkeling and hiking in the wildest region of Costa Rica on a day trip from Uvita or Dominical. Dominical feels a little like something that might have fit in on the California coast fifty years ago and surfers congregate here (and many never leave…) for the great beach and river mouth break, laid back atmosphere and casual restaurants, bars, hotels and hostels. The whole length of coast from Manuel Antonio south past Uvita is dotted with beach access where surfers can often have the breaks to themselves. Perhaps the single best adventure tour in Costa Rica is the trek up and rappel down the waterfalls of the Diamante river. Oh, and did I mention the part about sleeping behind the waterfall in between. If you’ve ever wanted to do something completely unique this is your chance. The area is relatively undeveloped with no big resorts although there are some very nice hotels. Dominical and Uvita are only half an hour from the larger resorts of Manuel Antonio and a little further from the condo towers on the beaches of Jacó.